You’ve been posting your scores and receiving eRevision for years. You know your handicap and you use it to your advantage at tournaments. But when it comes to the causal rounds and playing with your buddies who don’t even know what a GHIN number is, it’s a frustrating situation. Playing golf without a regulated handicap system is slow and difficult for differing skill levels to play in harmony. It’s time to share the adrenaline rush from getting strokes during a round and get your friend a handicap. Here are a few pointers to give you steady ground to convince your friends to start posting! They must be tired of losing against you, right? How – and why – would anyone willingly play scratch against a 15 handicap? Unless they want to keep buying drinks for everyone after the round, a Handicap Index can create a friendlier competition. 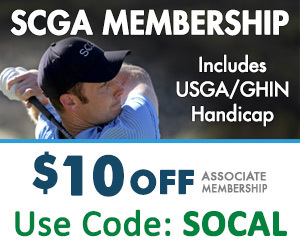 They’re always hearing about the awesome time you’re having while playing SCGA Championships at top-rated golf courses. So, instead of sitting at home watching the live scoring on their phone on the couch, why not join in on that four-ball tournament? Let’s be honest, regardless of how good you are, playing gross isn’t great when you know a handicap can give you the score you deserve. And nobody wants to watch a score of 90 take the “W” at your weekend matches except for that golfer who doesn’t have a handicap, of course. Explain to your “pro-gross” friends why once you play NET, they’ll never go back. One of the best ways to keep track of your game is reviewing your recent postings… through your handicap! Show them how satisfying it is to look at your bi-weekly eRevision and watch those scores drop as your game improves. Or, vice versa (it happens,) but it’s a great reminder for when you need to hit the range or see a PGA instructor. Keeping track of your index means you’re always working towards something and not mindlessly swinging away! Just like every other golfer on the planet, St. Andrews is probably on their bucket list. While for most it remains an uncrossed bucket list item, it can’t become even a thought for golfers who are GHIN-less. Every golfer who can even score a tee-time at the Old Course, must have a handicap in order to be allowed on the first tee.